At some point in every player's Minecraft experience, that player will want to play around with rails and make a mine cart roller coaster track. 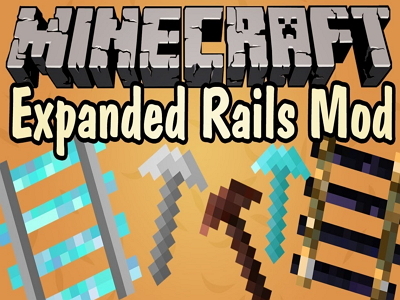 While this is all fine and dandy, the players that love this sort of approach will greatly appreciate the additional options that the mod in this article addresses.What the Expanded Rails mod for Minecraft adds to the game is the ability to color-code your tracks, play around with the momentum of your rail courses, and even construct specialty monorail tracks. This most basic of the mod’s offerings allows you to craft different varieties of rail by using materials like lapis lazuli, diamond, emerald, obsidian, and even dyed wool. Advanced Rail Crafter. This special crafting table is 4 spaces by 3 spaces, giving you just enough room to construct the specialty rails for monorail tracks. Monorails You can create special monorails that all work slightly differently:* Diamond. Has a bigger initial thrust and general moves faster than normal track. * Ice. This track slows down your cart as it moves across. * Explosives. This track causes medium-size explosions to detonate as you cross over it. * Chain. Can pull a mine cart up-hill without needing any power. * Ender Pearl. Cannot be placed on solid surfaces but will hover in place. * Lapis Lazuli. Causes a vertical rise when crossed. This can be worked into an elevator.